(CBS/AP) MANCHESTER, England - Mike D'Antoni was there for the start of Linsanity, Kobe Bryant on the wrong end of its greatest highlight. Neither imagined next season opening without Jeremy Lin on the New York Knicks. "No. Not when the kicker was they can match. I'm thinking, for sure," said former Knicks coach D'Antoni on Wednesday before the U.S. Olympic team practiced. "Even when I was there, well at least we got him, we don't have to worry about him blowing up and us not being able to afford it." But the Knicks ultimately decided they couldn't or wouldn't. Lin became a Houston Rocket on Tuesday night when the Knicks refused to match a three-year deal worth about $25 million, ending a brief but amazing run as New York's point guard. The Knicks had repeatedly said they planned to keep the restricted free agent, and Olympians Carmelo Anthony and Tyson Chandler both believed they would. "I know the Knicks organization wanted him back, I know his teammates wanted him back, I felt like Jeremy wanted to come back, but can't pass up what Houston threw out there," Chandler said. D'Antoni, who gave Lin a chance to play in February, resigned a month and a half later when the Knicks were struggling. He remains a firm believer in the undrafted point guard from Harvard. Bryant had no choice but to become one after Lin scored a career-high 38 points, outplaying one of the NBA's biggest stars during a nationally televised victory over the Lakers. "The plays that he was making, it didn't seem like he had too much of a difficulty making them. He seemed like he was pretty comfortable in making those plays and he was pretty consistent afterwards," Bryant said. "His numbers weren't 30 and 15 assists or whatever, but they were more than solid numbers. He can play, he's a very good player." How good is impossible to predict, because Lin made just 25 starts before his season ended because of surgery to repair torn cartilage in his knee. His numbers were already falling by then, a combination of fatigue and a lesser role in the offense once Mike Woodson replaced D'Antoni, who is now an assistant coach on the U.S. Olympic team. "I mean, I don't think nobody really has an idea what his ceiling is," Anthony said. "What he was able to do for that little stretch that he played before he got hurt, he was at the all-time high, from a game standpoint doing what he was able to do, averaging 20 something-plus points, almost 10 assists. I'm ready to see what's next." He would have seen it in New York, but the third year of the contract, worth nearly $15 million, could have cost the Knicks more than double that in luxury tax payments. "Houston threw something in the game that was kind of crazy," Anthony said. 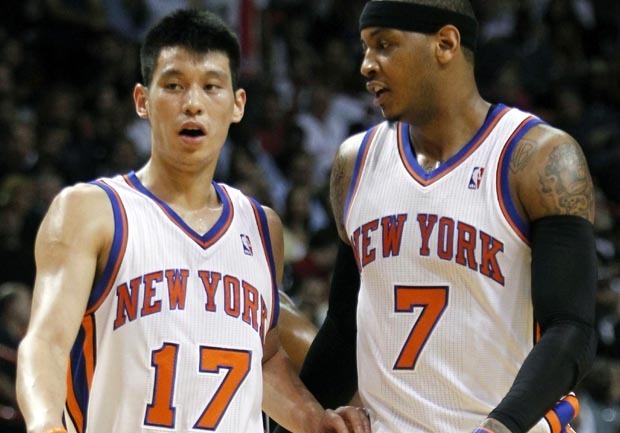 CBSSports.com's Gregg Doyel says the Knicks are foolish for letting Lin go. "Three years from now, (Carmelo) Anthony will be 31. (Amare) Stoudemire and (Tyson) Chandler will be 32. Jeremy Lin will be 26," Doyel writes. "And the Knicks chose all those guys -- a core that has demonstrated it can't win -- over a young point guard who went 16-10 in his magical 26-game run last season? So stupid, I can't make sense of it." It's possible Lin may never live up to the deal, but D'Antoni refuses to rule it out. And he won't accept the idea that Lin was only a creation of his high-scoring offensive system. "First of all, I think that's not fair to anybody, I think especially not to Jeremy," he said. "For 20 games he was one of the best in the league and he was dominating from the headlines to even on the basketball court. So you can't discount that he'll never be able to do it, because not only did he do it, he did it at the highest level possible. "So I'm happy for him, I think it's a great contract for him and Houston could find themselves a very, very, very good basketball player. At least he's going to be a good player. The guy's got quickness and determination, so he's going to be good. Now it depends on what level, nobody knows that, but I wouldn't bet against him."